Where is The Coffee Baa? The Coffee Baa is located in Springfield, in the City of Ipswich. Springfield, built as part of Greater Springfield, Australia's largest master-planned community, is an easy 35 minute drive from Brisbane's central business district, making it a great place for a meal out away from the hustle and bustle. There is plenty of street parking available, and is also conveniently located a few minutes away from Springfield's picturesque and iconic lake, which makes for a great spot for a stroll to walk off some newly ingested calories. There's a reason why this spot is so popular with the locals! The Coffee Baa's business card. What's The Coffee Baa like? Well, with a name as clever as The Coffee Baa (get it? ), what's not to love? The Coffee Baa is a relaxed little cafe with a recurring theme of yellow and black that matches their logo - even the chairs are matching! 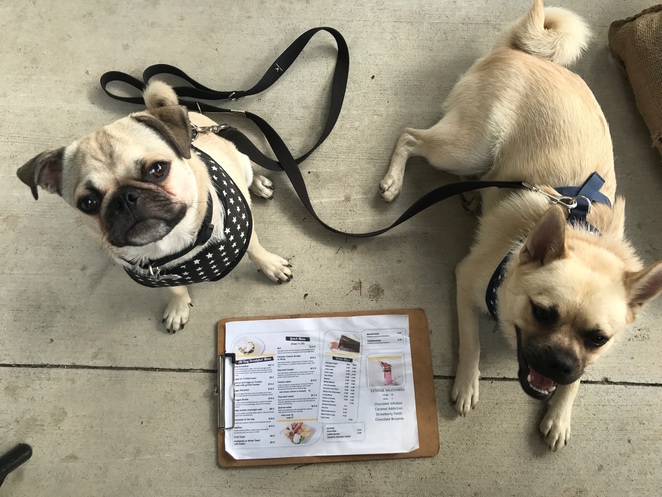 There is plenty of outdoor seating available, with both traditional tables and chairs in addition to higher tables with bar stools - sit wherever picks your fancy. There's also some indoor seating available too, although it is more limited, numbers wise, compared to outdoor seating. Dogs are more than welcome to join their families provided that they sit outside; water bowls can be provided upon request. All in all, aesthetics and ambience wise, there's nothing to find fault with - I guarantee you'll love it as soon as you lay your eyes on it. Outdoor seating at The Coffee Baa. Some indoor seating is available too, although more limited. What food and drink are available at The Coffee Baa? 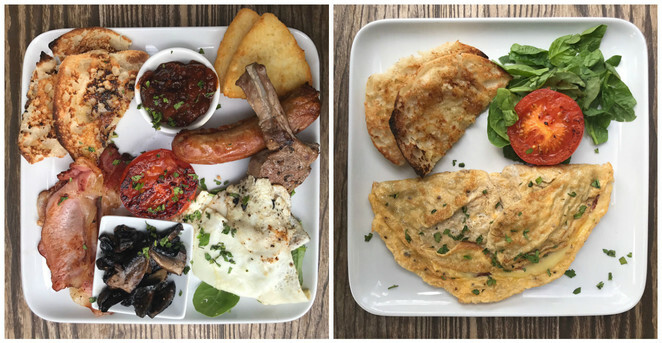 The Coffee Baa serves up a wide range of all day breakfast, perfect for those who much prefer eating breakfast, the most important meal of the day, even when it's not strictly breakfast time anymore! Plus, it means you don't have to get up early to order breakfast - you can still have your weekend sleep in. The Coffee Baa's breakfast menu comprises of all your favourite classics (e.g. Eggs Benedict, Waffles) and classics with a twist - their Big Breakfast is called the 'Baa Breakfast' here! For those who like eating a hearty lunch rather than breakfast, The Coffee Baa's lunch menu is served alongside their all day breakfast menu from 11:30am onwards; choose from something fresh like a Caesar Salad, or opt for something heartier like a Baa Beef Burger. As for drinks, because no meal is complete without a drink to complement the food, there is a wide range of hot and cold drinks here. Beware - The Coffee Baa takes their drinks seriously. Opt for a regular Hot Chocolate, or go for the Extreme Hot Chocolate; order your usual Milkshake, or upgrade to one of their Extreme Milkshakes - go on, you only live once! Oh, and check out their display cabinet at the counter to if you want to tempt yourself with some delicious looking sweet treats... oh go on now, you know you won't be able to resist. The Coffee Baa's breakfast and lunch menu - click to enlarge. So many sweet treats to choose from! 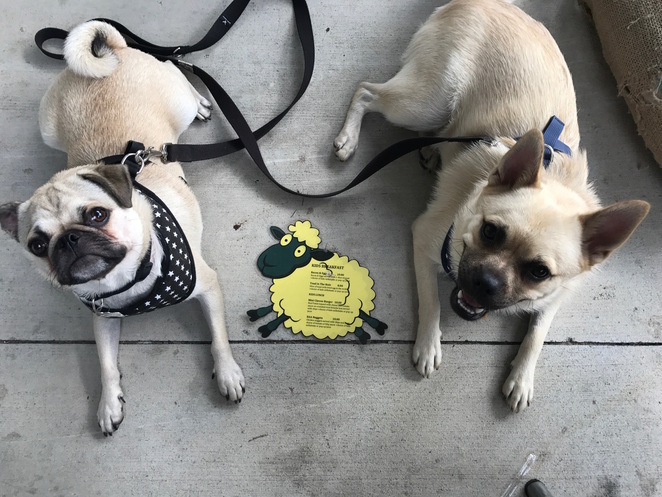 There is also a separate menu for the little ones, which, true to the name of the cafe and in keeping with the colour theme, is cutely presented on a little yellow sheep. Anyone up for a Toad in the Hole, or a Mini Cheese Burger, or perhaps some Baa Nuggets? Kid's menu at The Coffee Baa - click to enlarge. How was the food and drink at The Coffee Baa? Seeing as there were a few large families there at the same time as us with only two staff working, we thought our order would take a while - but boy, were we wrong! The coffees came out almost immediately, with the food following shortly after - without, of course, sacrificing quality for time efficiency. Between two people and two dogs, we ordered one soy cappuccino, one mocha, one Baa Breakfast (grilled smokey bacon, eggs, thick pork sausage, grilled mushroom, topped with a lightly spiced tomato chutney, grilled tomato, lamb cutlet, and hash brown with Turkish bread), and one Omelette of the Day (served with toasted Turkish bread and grilled tomato). The portion sizes were very generous, and was more than enough - and of course, perhaps most importantly, they were both delicious. The Coffee Baa was also able to accommodate my dietary requirements (eggs fried without the yolk, due to allergies), which was much appreciated. And perhaps best of all, I enjoyed my coffee that extra bit more, knowing that I didn't have to pay extra for ordering a coffee with soy milk - that's right, there is no surcharge for soy, almond, and lactose free milk! Amazing coffee - plus, buy 9 and get your 10th cuppa free! Eddy and Sam pictured with the Baa Breakfast & Omelette of the Day. Yum, double yum! Close up of the food. Definitely getting one of these next time! Photos taken from The Coffee Baa's Facebook page, and compiled into a collage. These look both cute and yummy! Photo taken from The Coffee Baa's Facebook page. Is there anything else worth noting about The Coffee Baa? If you've got little ones and want to keep them entertained during your visit, or if you've got a competitive streak, The Coffee Baa has a solution to your potential problem - who doesn't love a good old board game? Whether you'd love a game of chess that requires complex thinking, or a (relatively) simpler game like tic tac toe, The Coffee Baa has got you covered; not with cheap plastic versions of the games, but ones made of actual glass and marble. Win the game, and you'll be winning in style! If some friendly competition isn't quite your thing, The Coffee Baa also has a stack of newspapers and magazines available for customers to browse during their visit. Fancy a game of chess or good old tic tac toe? Thanks for a lovely breakfast, The Coffee Bar - we'll be back to try those Extreme Milkshakes! Note: Commercial Drive, where The Coffee Baa sits, is home to a host of other great restaurants including The Greek Mediterranean and Salt n Battered. 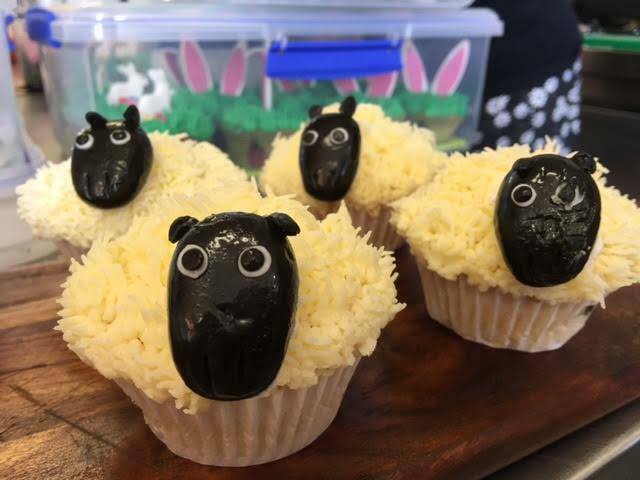 The baa cakes are so cute. Want to try it now.